St Patrick’s Sports Carnival. A successful gathering will Show a handsome profit. St. Patrick’s Day was commemorated in Heathcote yesterday, when a sports carnival was held in the show grounds. The committee were favored with exceptionally fine weather, and in consequence there was a nice attendance of townsfolk and visitors from the surrounding districts, together with a goodly number of patrons from a distance. Upon this occasion of the local celebration of St Patricks’ Day, the sports program was slightly varied. a number of horse and hunting events being substituted for the dancing competitions, with the happiest results, both from an enjoyable standpoint and financially, thus making the celebration an undeniable success. The excellent and interesting program was run off without a hitch, and the committee is deserving of every praise for the creditable manner in which they carried out their various and sometimes arduous duties. The hunting and jumping competitions proved to be a very pleasing and attractive innovation, inasmuch as the horses competing were some of the best of their class -notably, those belonging to Messrs. Glens, Hicks, and Robin’s animals, which, by the way, were exhibited at the recent show of the Heathcote Agricultural, Horticultural and Pastoral Society. The Draught Horse Handicap was somewhat of a novelty, and attracted no mean amount of interest, while causing much merriment. Specially admired were the selections rendered by De Gilio’s String Baud, and the committee is deserving of every praise for securing their services. Every event on the program was closely contested, and got off well to time, with the result that there was not a dull moment all day. Additional amusement was also afforded both young and old by the presence of numerous counter attractions, and these were liberally patronised. The fruit and lolly stall was conducted by Miss Morrison, assisted by Misses Farley (2) and Lacey. Mesdames T. J. Farley, Gallagher and Miss Brennan presided over the fancy good stall, and were ably assisted by Mesdames P. Ring, Harris, Lally, Mardline, Misses Dempster, Smith, McCallum, Hood, Flowers, Ashworth and Mr Reid. A busy time was experienced in the refreshment booth, where Mrs J. J. Farley was in charge. Her assistants were Misses Doolan, Norris, Tehan, Gallagher, and Mesdames P. Ring, J. P. O’Brien. The president (Mr T. J Farley), conducted the publican’s booth in a most creditable manner and spent a busy afternoon. The other most noticeable workers were Messrs J. J. Farley, J. Perry, J. Ring, J. J. Murphy, R. C. Dwyer, M. Tobin, W. Watkins, J. G. Hill, and J. Long. The secretary (Mr T. P. Lewis) was one of the hardest workers on the ground, but he proved himself to be equal to the occasion, and carried out his duties efficiently and well. He was ably supported by the president (Mr T. J. Farley) and the members of the committee, all of whom worked hard to cause things to pass off smoothly. HANDICAP BICYCLE RACE One Mile. First, £2; second £1. GIRLS’ RACE, Under 15. First, 7/6; second, 2/6. QUOIT MATCH. First, £1 5s; second, 2/8. DRAUGHT HORSE HANDICAP. First, £2 10/ ; second, 10/-. HORSES HIGH JUMP. First, £5; second, £2. Wellington, Silver Light, Baruna and Iona also competed. STEPPING THE CHAIN. First, 15/- ; second, 5s. A grand ball and supper was held in the Shire Hall in the evening, and was a great success, the hall being crowded with trippers of the light fantastic. An open-air picture show was also held in the Barrack Reserve under the auspices of St. Patrick’s Sports Committee, and this, too, like the sports and the ball, was freely patronised. A special meeting of the McIvor Shire Council was held today to deal with a number of important matters. A full report will appear in our next issue. The old established town of Heathcote, or as it was familiarly known in it’s digging days, “The McIvor,” is a well situated but very quiet little town, distant about 30 miles from Sandhurst, Kyneton, Kilmore and Seymour; in fact a very common remark to hear is, that Heathcote is “30 miles from every. where”. In the busy time of the Fifties, when the miner reigned supreme, “The McIvor” was a stirring and progressive place; but, like many other mining towns, its glory hath departed, and a period of staid respectability has followed the strong pulsations of the gold fever. Unless fresh discoveries of the precious metal are made, of which there does not appear to be much probability, it seems certain that the future prosperity of the town must depend in a great measure upon the agricultural and pastoral resources of the district. Fortunately, the outlook in this respect is not discouraging. There is a considerable area of good arable land along the valley of the Campaspe River and the Wild Duck and McIvor Creeks, which is admirably adapted for cereal growing or dairying, while the poorer soil in the vicinity of the town is capable of producing fruit of excellent quality in abundance. Much of the land around Heathcote is quite equal to the soil of Emu and Axe Creeks, on which so many excellent vineyards and orchards have been established, there is absolutely no reason why a similar developmenit in the district, under notice should not be attended with equally satisfactory results. The rainfall – always a first consideration in the development of an agricultural district – owing to the proximity of rangy country, is a fairly copious one, a much heavier precipitation than that of the lower Campaspe being generally obtained. The isolated position of the town and district has been the main cause of the smallness of the cultivated area. At the present time, Heathcote is distant from Melbourne 130 miles by rail, the route being by way of Sandhurst from which city, a line was opened some 8 months ago. The railway line now being constructed from Heathcote to Kilmore will shorten the distance to the metropolis considerably, the mileage being reduced to something over 70 miles. When this line is opened, an event which will shortly take place, the cost of sending produce to: Melbourne will be so reduced that considerable development in the agricultural resources may be confidently anticipated. Heathcote is situated on the McIvor Creek, a tributary of the Campaspe. Contrasted with the towns which have sprung up in the new agricultural districts of the colony, it has a venerable appearance, its buildings being of the substantial order. The town consists mainly of the main street, which extends for a distance of nearly two miles along the main Echuca Road. The buildings are scattered, but the rows of splendid trees which have. been planted give it a continuous appearance, while the bends in.the road prevent a monotonous effect. Tree planting is now exciting a good deal of attention in the colony, and many shire councils are displaying commendable activity, in, planting the streets of the towns which come under their jurisdiction. The tree planting idea struck the Heathcote people, more than 20 years ago, and they.have every reason to be satisfied with their efforts. The pines and elms which have been most largely used, have now assumed large proportions and will compare favorably with any trees of the kind in the colony. Many of the Pinus Isaignia have attained a height of from 75 to 80 feet, and a diameter of 3 feet 6 inches. In the centre of the town, there is a park which is kept in excellent order, and also contains many fine specimens of the pine family, as well as numbers of well grown, deciduous trees and flowering shrubs. A well improved large estate, in the neighborhood of Heathcote is Mount Camel, the property of Mr C. P. Davis. The steading is distant 12 miles from the town, and the property occupies both sides of the Cornelia Creek for a distance of about 8 miles, along its course to Lake Cooper. Formerly the run was an extensive one, a large tract of the surrounding country being taken in, but the wave of selection which passed over the district had the effect of curtailing its dimensions, and at the present time it consists of 6500 acres of freehold, with 4500 acres of adjoining Crown lands, the character of which is inferior. The purchased land takes in the eastern slope of the Mount Camel range, and also encloses some excellent alluvial flats along the course of the creek. The estate has, been for many years under the management of Mr John Begg, under whose control it has been considerably improved and its stock grazing capabilities greatly increased. In its natural state a good deal of the land was heavily timbered, but with the exception of the trees required for shelter and the renewal of fences, the whole of the forest on the estate has been rung and the fallen timber burned off. A sward of natural grass has been thickened and its fattening qualities much improved by their process. The paddocks, 20 in number, are securely enclosed with.either 3rail or 7wire fences. Some chock and log fencing still remains, but this is being superseded as quickly as: possible by the better class mentioned. Tanks have been excavated in every paddock except those with a frontage to the creek, so, the water supply for stock is always ample. The creek being a permanent one and the tanks large. The hillsides are lightly timbered, with prettily shaped she oak trees, which serve to give it a park like and picturesque appearance. The homestead, is established on a slope, close to Cornella Creek, and is surrounded by a row of stately pines and a well kept flower garden and orchard enclosed by an excellent hawthorn hedge. The household water supply is at present obtained from an underground tank, while for the stables and other purposes a large dam, is utilised, the water being conveyed in pipes, and also used for irrigating the orchard and garden. It is Mr Beggs intention, however, to supply the house from, a large wooden tank lined with iron, which he intends to construct so that instead of the water having to be pumped it will flow by gravitation. The idea of an overground tank, is a good one, and has been adopted in the Rutherglen district, where several large brick cisterns have been built. The outbuildings at Mount Camel are numerous, well designed and substantially constructed, the stables and barn in particular, being very good.. An addition is now now being made to the woolshed for the purpose of erecting a driving shaft to which several Wolseley sheep shearing machines will be attached. Mr. Begg is of opinion, from what he knows of the machine, that it has many advantages to recommend it, amongst them being evenness of staple, and the absence of “second cut,” which always deteriorates the price of the wool. Only suficient cultivation for the use of the stock on the estate is carried on. Fifteen acres are cropped every year for hay and the method now adopted in dealing with the cultivation paddocks is to take off a couple of crops and lay the land down under lucerne. This fodder plant succeeds so well in the district that Mr. Begg intends to go in largely for its cultivation and eventually a considerable extent of the flat along the creek will be sewn down. About 30 acres are under lucerne, at the present time, and the area will be increased at the rate of 15 or 20 acres per annum. The land is prepared by being ploughed, harrowed twice, rolled, and the seed sown at the rate of 12 lb. per acre, a fine light harrowing being given as a covering. The sowing is generally done in August, and the following autumn the lucerne fields are lightly stocked with sheep. The most experienced cultivators of the plant are unanimous in saying that lucerne should only be stocked during the months of June and July. At all other times of the year the growth should he cut. This appears to be too troublesome a method of dealing with the plant to suit the tastes of many who cultivate it, and stock are there turned on at any time of the year that is convenient for the owner. Mr Begg finds that his lucerne fields begin to grow weak in about 6 years, a renewal being necessary about that time. The only cereal crops cultivated is either wheat or oats for hay, the yields being about 2 tons per acre in a fair season. Sheep are the principal stock kept, and for many years past Mr. Begg has devoted considerable attention to raising the standard character of his flock. The main object in view, with regard to the stud flock at Mount Camel, is to breed rams for use on a station, which Mr. Davis owns near Bourke, in New South Wales. The first start was made about 18 years ago with some ? (unreadable) sheep obtained from the Coliban Park stud. These sheep were originally from the stud of Mr. James Gibson Bellevue, Tasmania.Rams were subsequently obtained from this gentleman and used with great success. A draft of ewes from Mr. E Willis’s Woolomert Stud, were also introduced and with those as a nucleus, he present stud has been bred. The sheep are carefully classed every year, and from 50 to 100 ewes selected for stud stud purposes. The stud flock numbers about 900 ewes, and after the third lambing these are sold, their places being taken by younger sheep. Rams of a strain. which have been found to nick well with the class of ewes on the estate are purchased every third year. The breeding flock numbers about 2580 ewes, and as a rule about 10,000 sheep are shorn every year. The average lambing has been 85 per cent. The sheep possess good frame and are well clothed on all points with dense and fairly lengthy wool of excellent quality. Mr. Begg has exhibited his sheep at several shows, notably Murchison in the Goulburn Valley, and has been a very successful prizetaker. A few good Shorthorn cattle are kept on the estate. They are of the Bates’ strain and altogether the herd numbers 38. The bull now in use is Agamemnon’s Hopeful, , recently purchased from Mr. Henry Stevenson’s Nidrie herd, and bred by Mr. 0. B. Fisher. The horses number about 40 head, amongst them being 15 draughts. the remainder being hacks. A very useful looking stallion named Tattigan, by McGregor from a trotting mare by Lothair, is now doing stud duty. He is a good horse, standing over 16 hands in height and showing both bone and quality. A mare by the well known trotting sire, Boccaccio, is worthy of notice. The rest of the hacks are a very good lot, most of them being by McGregor and Ladykirk. 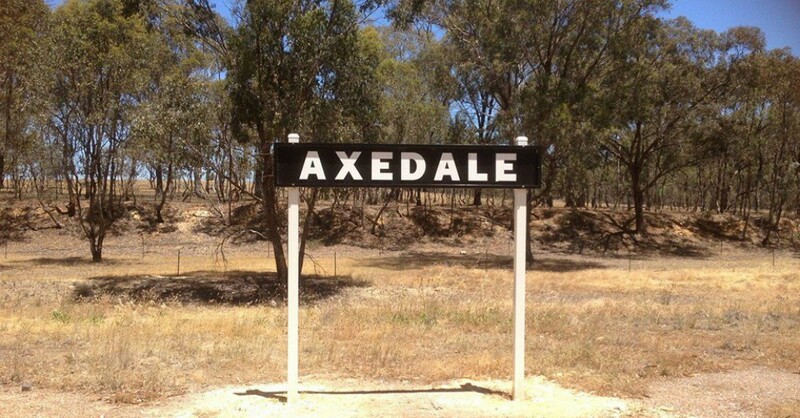 Heathcote is about 25 kilometres from Axedale, and is included in the surrounding area of Axedale for this One Place Study. The following newspaper article shows just what a thriving town Heathcote was in the 1860’s. The list of businesses shows that many businesses were still surviving after the glory days of the goldrush. Many miners stayed in the area and began to farm the very fertile land surrounding Heathcote. HORRIBLE CASE OF POISONING NEAR HEATHCOTE. One of the most fearful cases of poisoning that it has been our lot to record for some time occurred yesterday, at the station belonging to Messrs. Cox and Bissett, near Heathcote. It appears, from what we have been able to glean of this horrible affair, that the cook on the farm wishing to make some cakes for dinner, and being short of flour, went to a cask of arsenic, kept on the premises, and used, we suppose, for the purpose of cleansing sheep, and took therefrom a portion of the arsenic, supposing it to be flour, using it in the same manner as he would have done had it been so. Two men who were engaged on the farm partook of those cakes, as well as the cook; and the three men, after suffering fearful torments, died yesterday afternoon. This is another instance, added to the number that have already occurred in the colony, of deaths resulting from poison being allowed on premises without any precaution being taken to prevent ignorant domestics from making use of it for culinary purposes ; and unless some check is put by the Legislature upon the sale and use of poisons of all descriptions we are afraid that it will not be the last. We understand that an inquest is to be held on the bodies to-day, when we have no doubt that some more particulars connected with this awful affair will be brought to light.